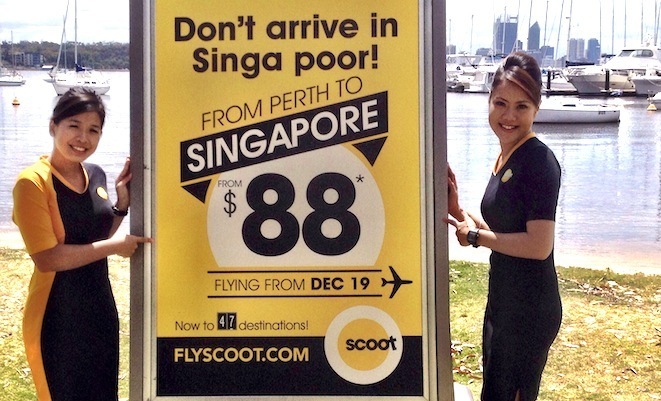 Scoot enters the Perth market with a highly attractive $88 oneway fare. Perth continues to attract growing international interest, with low-cost airline Scoot the latest to add services to the city. Becoming the airline’s third Australian destination, Scoot will begin its five-weekly services on December 19. The flights will depart Perth at 1930 and arrive at Singapore at 0045, with the return service departing Singapore at 1250 and arriving at 1830. The new schedule aims to stimulate inbound as well as outbound travel, using Singapore as a favoured destination for Australian travellers and as a hub for onward flights to more than 46 cities offered by Scoot and its partner airlines. To celebrate the launch Scoot is offering a promotional fare of just $88 one way including taxes. The entry of Scoot to the market intensifies competition – and choice for travellers. On the announcement of Scoot’s new services, Air Asia X, which began services between Perth and Kuala Lumpur in November 2008, issued a statement saying it welcomed the competition. “We welcome competition in the market and believe that new entrants will help stimulate travel for all operators and provide greater choice for travellers,” said AirAsia X CEO Azran Osman-Rani. “We believe international travel should be affordable for everyone. Australians have successfully adopted low cost long-haul travel and the people of Perth have thrown their support behind AirAsia X and our low fares from our first flight there in 2008. “In response to continued demand, we’ve previously announced an increase to double daily flights from Perth to Kuala Lumpur, Malaysia commencing November 25, up from the current nine flights per week,” Osman-Rani said. AirAsia X’s offers strong connectivity via Kuala Lumpur, with more than 80 onward destinations available throughout Asia.